A lesser-known part of your overall oral health that many patients may not know by name is the TMJ. The TMJ (temporomandibular joints) can be felt right under the ears as you open and close your mouth, pressing against the skin. They may be small, but they have the enormous responsibility of connecting your lower jaw to the skull, helping you perform essential activities like eating and speaking. If this system is thrown off-balance, it can result in serious pain and stress for your overall health. Thankfully, the Water’s Edge Dental team can lend a helping hand with cases of TMJ disorder. Dr. Bannan performs thorough evaluations of the TMJ during regular dental exams and can recommend therapy when needed to help restore harmony to this essential system. To get started, all you need to do is schedule a consultation here in South Daytona, FL. 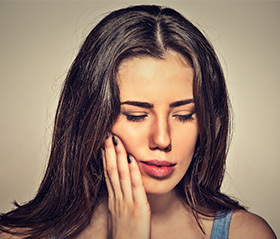 Occlusal Adjustment – If your symptoms are traced back to a misaligned bite, an occlusal adjustment may be able to bring back your smile’s overall sense of balance. Dr. Bannan will precisely adjust certain teeth in order to more evenly spread biting pressure and eliminate undue strain on any particular area. Occlusal Splints – Occlusal splints are similar to nightguards, and our team may ask you to wear yours throughout the night or even at all times. This appliance will help reposition your upper and/or lower jaw into a much more comfortable resting position so that the TMJ and its surrounding facial muscles can relax as well. In many cases, the diligent use of an occlusal splint can even permanently improve jaw function and eliminate chronic pain altogether.